Gone to watch, discover and learn, French won unexpected but earn victories with very good fights against experienced opponents. Titouan FISSORE-HOSPITAL : bronze medal in sword / shield category. Thomas GUILLY : bronze medal in HMB-Soft triathlon. France-Russia Team (with Titouan FISSORE-HOSPITAL, Alexandre DEFAIN and Tiffaine CAZAUCURT-BARRATIER in the French side) : silver medal in 5 vs 5. Hereafter these very good sport results, it’s an extraordinary human and intercultural experience that our young French fighters lived. 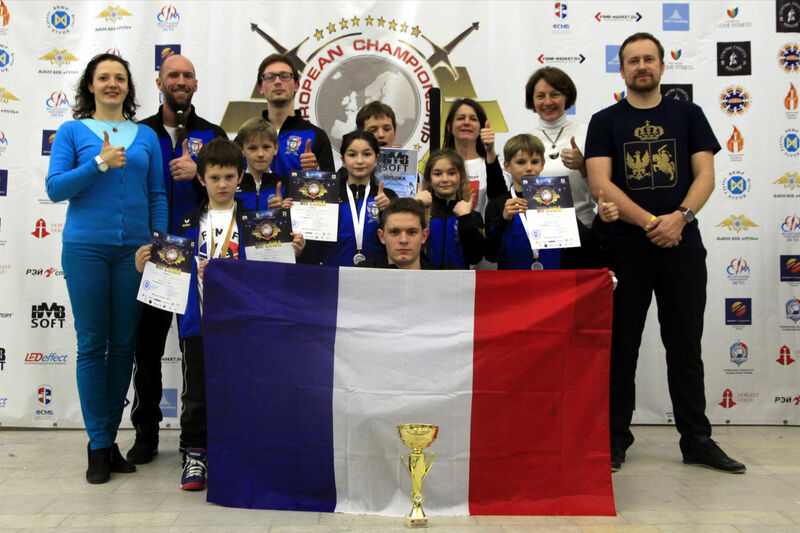 France Team has been noticed for its cohesion : duelists and team fighters were hold by cheerings and the strong support from all the group. For all thses young people who lived this experience far away from home, un turning point was reached : they all come back stronger and cohesive than ever. All have sympathized with foreigner atheletes, especialy Russians and Poles. The language barrier does not stop playing and sharing, especially when you are young. Friendships are born, we hope they can meet again at the next edition of the European Championships in 2018, which is likely to take place in Poland or Moldova. FFMSF congrats all the fighters for their involvement in and out the fighting area, and the staff for their time and energy. Thank you very much to Amicale Laïque of Champeix and of Saint Germain l’Herm for their support in this adventure. We are already thinking about 2018. If you want to become partner, please contact us !